“If the sun is in the wrong position for your camera, I’ll turn the house around,” said Mrs. Richard T. Foster as a Daily Town Crier reporter set up the necessary equipment to photograph her unique revolving house. The sun was three-quarters of the way to the west horizon. 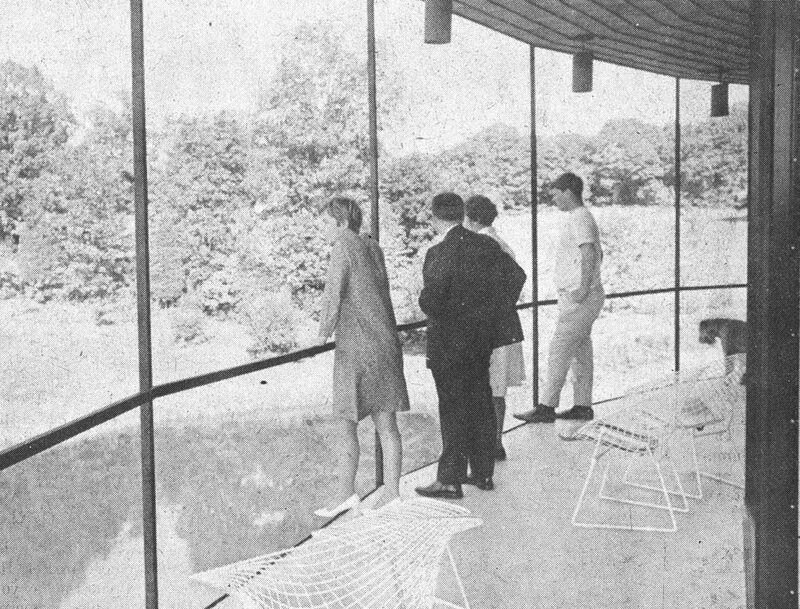 The living room faced Pope’s Pond, the chairs on the circular deck looked out over the pine woods. With the ease of changing a television channel, Mrs. Foster turned the dial located beside the central staircase, and slowly the house began to move. The house, an amazing combination of glass, steel, wood and shingles, located off Olmstead road in Wilton, has as its core what might appear to those with the slightest imagination a stem very much like that of a mushroom. In the base of the stem is the front door. It doesn’t move, just everything above it. And even then, the house isn’t moving all of the time. To enter the Foster residence. one must walk across a circular, cobblestone terrace of small Italian bricks, which is receiving finishing touches by Richard Foster and his three sons. Bradley, 16. Rob. 20. and Craig, 21. The front door is large and wooden with a black iron ring. “If the front door were here one day and there the next, a casual visitor could become disoriented,” Mr. Foster explained to a re-porter. 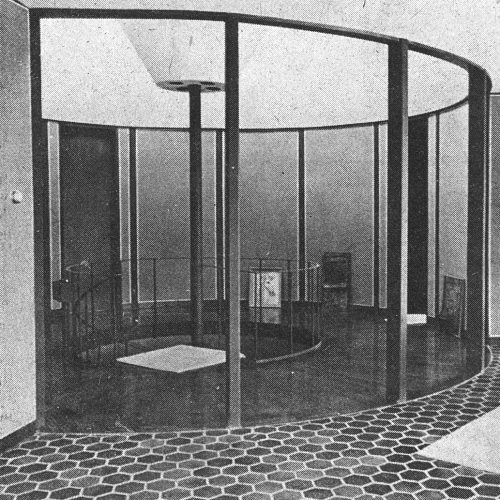 A circular staircase of steel and carpet leads from the front door up to the living quarters above. Everything necessary for living comfortably is located on this round plane. Radiating from the staircase are ten large rooms, each with a different view. Each view can be changed with a flip of the wrist. 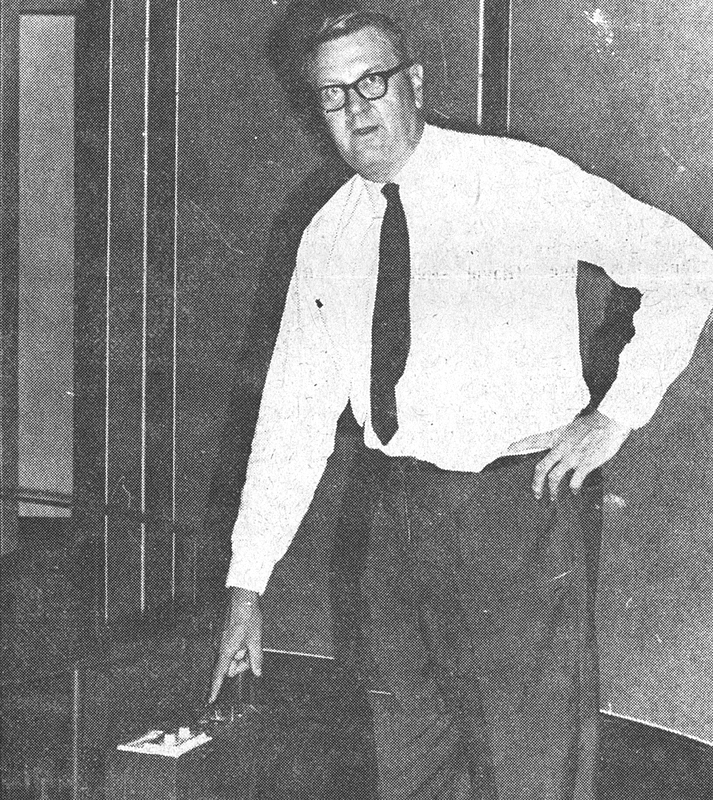 The motion of the house is controlled by three buttons and a dial ,that Mr. Foster describes as “simple enough for a 4-year-old who can read.” The buttons say “forward.” “Backward,” and “stop.” The dial, numbered from one to 10, regulates the speed. The house can make a complete revolution in 48 minutes vvhen the dial is set at i. top speed, explained Mrs. Foster. At i. slow-est rate. it takes four hours. “What about your dog’s equilibrium?” asked the reporter. “Oh. Beau loves it. The house moves slowly, evenly. You hardly notice it’s moving at all. If the house is turning, the dog likes to sit out on the deck. It’s cool there,” said Mrs. Foster. 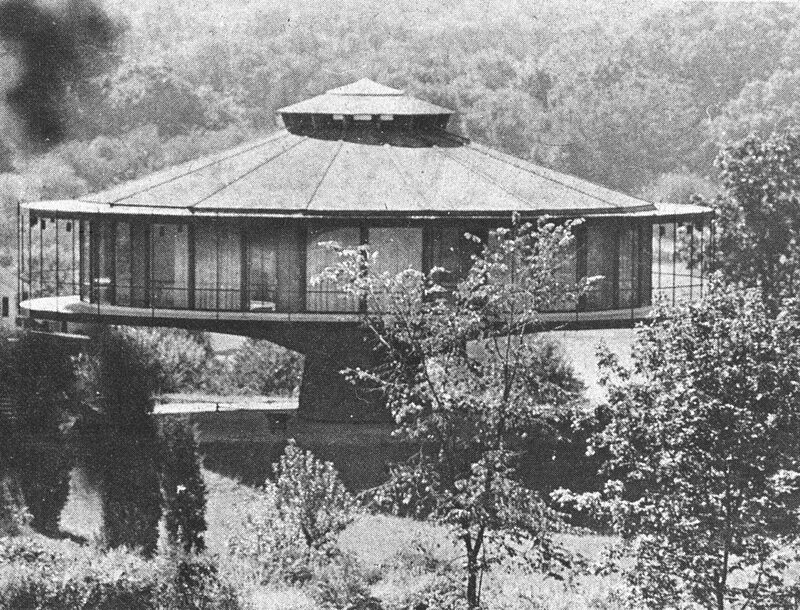 When the Fosters fist considered building a house on this particular piece of property, the idea of a rotating house had not yet entered their minds. And their minds were continually battling with the various views the front of the house could face. “When the idea came to me, the only problem was finding the right parts,” said Mr. Foster, a 49-year-old architect whose office is in New York. Mr. Foster thought the idea was a new one, one never before to be carried through. 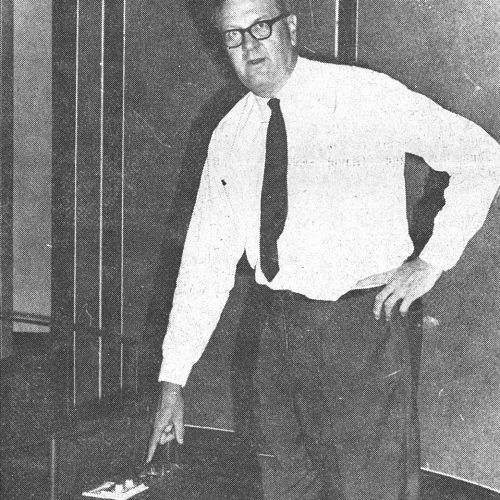 When he presented the idea to his wife. she too thought it quite unique. “As far as I know, this hasn’t been done anywhere else in the world,” said Mr. Foster. The integral part of the house is a 14-foot ball-bearing assembly that moves the half-million-pound rotating structure above it. The balls ride on raceways of hardened steel wire, and the de-sign provides for simultaneous transmittal of axial, radial and tilting moment loads. The mechanism itself is strong enough to take vertical loads of up to five million pounds and withstand sideways forces created by 125-mph winds. The ball-bearing is operated by a one-and-a-half horsepower motor located in the stationary portion of the core, and the running cost is approximately that of a refrigerator. The ball-bearing, which came from Rotek, Inc., a manufacturer of multiload bearings for large cranes and excavators, is said to have a life of 87 years, said Mr. Foster. However, in case it ever has to be replaced; four jack points. have been provided which will make it relatively simple to elevate the rotating section above the pedestal and ship in a new bearing. 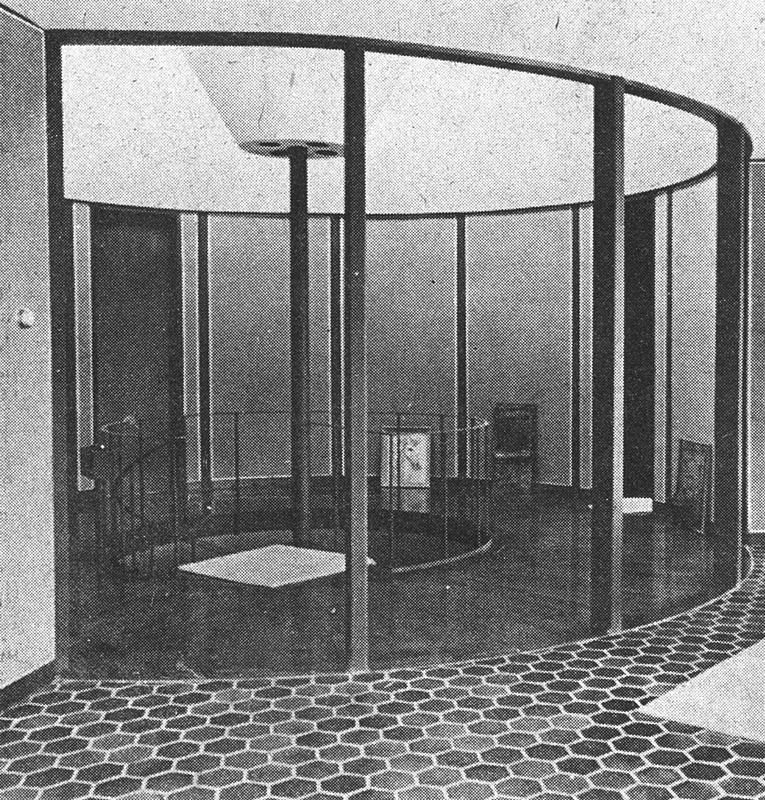 A center ring at the top of the house supports the weight of the rotating structure, which is equalized straight down to the giant bearing. The load distribution is even and level and thus eliminating any balance problems which might occur if many people were crowded into on room with no counterbalance on the opposite side of the house. It also eliminates any problems that might occur due to forceful winds. “The only problems we actually encountered in construction. were those dealing with plumbing, heating and electricity,” she said. 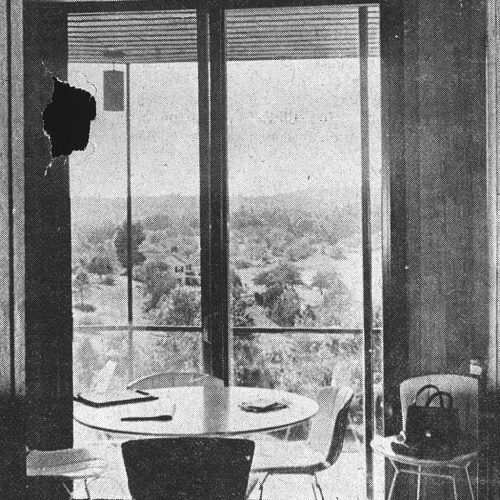 But Mr. Foster solved the dilemmas by shrewdly improvising from existing special-purpose hardware and materials. The problem of water supply was solved by installing a staionary intake pipe which runs up the inside of a service core in the center of the circular stairway. A special swivel joint on to, of this pipe carries water to the plumbing lines, which are, placed in the attic and lead down between the partitions to the Kitchen, baths and laundry. There is a circular collection trough which is located on top the stationary pedestal or core just inside the rim of the rotating section. The first trough has a narrow “gasket trough” on each side, both filled with water. If there is any overflow, it will spill into the collecting trough since the inner wall of each of these smaller troughs is lower than the outer wall. The collection trough is pitched to four drains located 90 degrees apart, The drain leads down through the walls of the core to a septic field. All of this is stationary. Feeder drains in the rotating section are located under the floor and lead back toward the core where they empty into the collection trough through elbows in an upside-down circular channel. This cap ring, located on the rotating section, covers all the, way around the stationary collection trough. The sides of the cap ring fit into the gasket troughs and extend below the water-line but not far enough to rub against the bottom. Extending, from the cap ring up through, the roof are four standpipes, again, 90 degrees apart. In order to solve the electrical problem, Mr. Foster Vet; “to use a trolley system which distributes electrical power to moving equipment. The system is designed so that power can no, taken off anywhere along the length of the track. The circular track, slightly larger than the diameter of the core, is hung from the rotating section while the trolley is securely attached to the stationary part of the pedestal. Two 250-gallon oil tanks are located under the roof which feed. the fuel to the furnace. Heat is carried throughout the house; through radiators recessed into the floor around the perimeter, below the Thermopane windows and doors. The house is entirely, insulated. None of the usual appurtenances are visible. 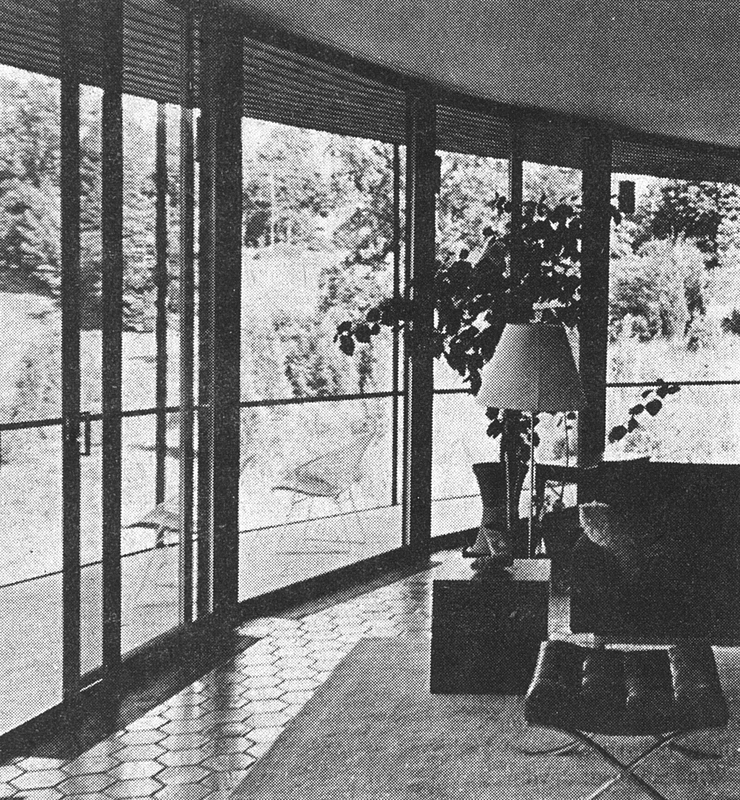 Each wedge-shaped room of the ten-roorn house is light anciairy with a curved glass wall looking out over the surrounding, countryside. 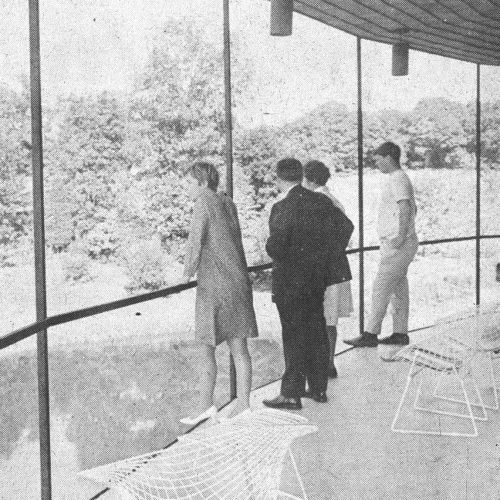 The 50-foot wide living room has a steel fireplace and is fully furnished with Mies van der Rohe chairs and a coffee table as well as a straight-lined sofa, covered in black wool. It is completely: open to the stairwell. 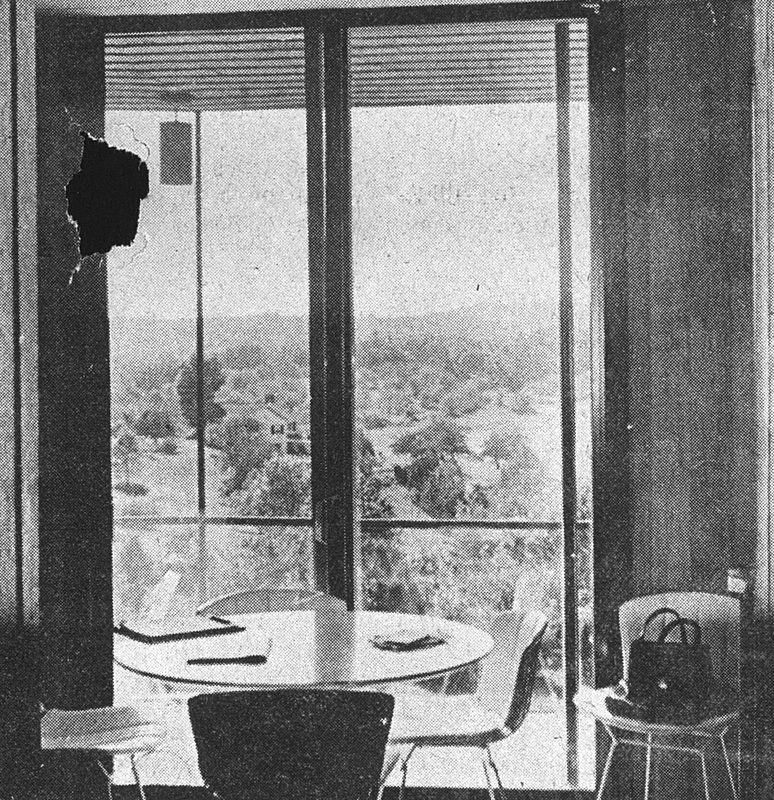 Approximately 300 yards of material were used in making drapes for the glass wall. 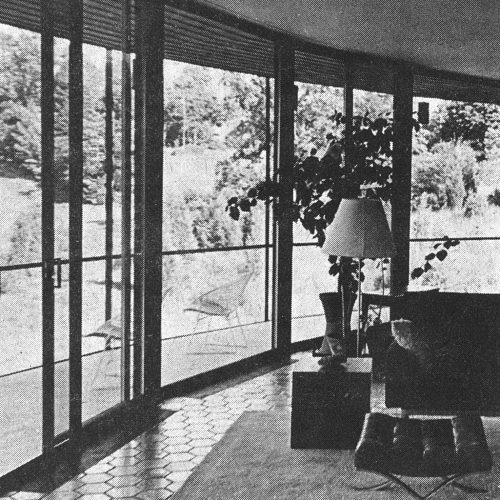 In designing his now-famous house, Mr. Foster made the kit, then a “delight” for his wife to use. Taking advantage of the, rotation idea, Foster designed one kitchen cabinet to turn a full 360 degrees, while another rotates 180 degrees. Another innovation in the kitchen is a moveable cooling unit; which can be pulled out of the wall and moved any place in the, kitchen. Just because the house rotates doesn’t mean that it has to be: circular, Mrs. Foster explained. “It could be any shape you want’ We wanted our’s circular. 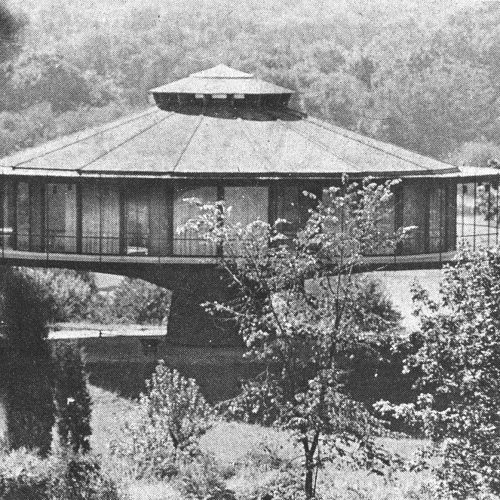 Due to publicity in various newspapers and international an national magazines, many visitors have been stopping by, the circular house. “Up to now we’ve been courteous.” Mr. Foster said.